By bailing out banks and targeting equity prices, the central banks are exacerbating the misallocation of savings/financial capital to historically overvalued corporate equity. What happens when central banks make credit cheap and abundant? All that cheap money chases scarce productive assets. The yields on assets drop, and speculative "risk-on" assets are boosted into bubbles. Even as corporate profits have skyrocketed, equity valuations have risen apace, keeping yields at historically low levels. Just to state the obvious: does that trajectory strike you as sustainable? Up almost 300% in less than four years? 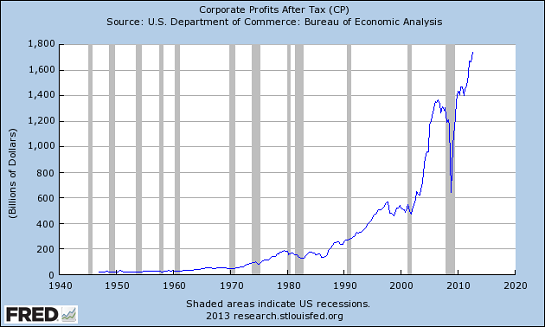 In a debt-burdened global economy, where are the next $1.75 trillion in corporate profits going to come from? This is characteristic of the liquidation/hoarding of a debt-deflationary Long-Wave Trough depression. The financial media and economists want us to believe that the Fed printing is "stimulus" when in fact it is part of the "liquidation" of Fed member banks' balance sheets of bad assets. With the 10-yr. avg. P/E of 22-23, a 10-yr. earnings yield of 4.5%, a dividend of 2% (0% in real terms before fees and taxes), average reported earnings growth since '00 of 3-4%, the real yield on 10- and 30-year Treasuries of slightly negative to 1%, and real wage/salary growth of 0%, the imputed discount rate implies inferior returns to capital vs. continuing decline in returns to labor; these conditions are not conducive to private sector investment growth and employment. Historically, the only "solution" was debt deflation and consumption of financial capital to the point that debt and asset prices fell to a level at which the imputed discount rate rose to encourage investment at rising returns to labor's share of GDP, i.e., inflationary Long-Wave Upwave. By bailing out banks and targeting equity prices, the central banks are exacerbating the misallocation of savings/financial capital to historically overvalued corporate equity of the Fortune 25-300 firms, resulting in low-velocity hoarding and worsening wealth and income concentration, unproductive rentier speculation, further declines in labor's share of GDP, and contracting trend real GDP and gov't receipts per capita. Along with these conditions are the once-in-history effects of Peak Cheap Oil, falling oil exports per capita, deteriorating EROEI, population overshoot, and accelerating automation of labor and loss of income and purchasing power. Consider that market cap-to-GDP today is 110%, ~100% above the historical average and 230% above the average of secular bear market lows. The differential $8-$12 trillion in market cap, primarily held by the top 0.1-1% to 10% of households in form of the equity of the Fortune 25-300 firms, is effectively captive current and future savings/investment/business, household, and gov't consumption that otherwise would occur at the given ratio to wages, profits, and GDP. George Brockway made the case in his book, The End of Economic Man: Principles of Any Future Economics (1995), that a stock bull market is a disaster, because bull markets coincide historically with growing wealth and income concentration and gross misallocation of savings/financial capital that encourages unproductive gambling and speculating, bank leverage, and bubbles that burst and cause mayhem. However, we are conditioned by the dominant rentier zeitgeist that rising asset prices (debt-money proxy claims on wages, profits, and gov't receipts in perpetuity by the top 0.1-1%) are an unambiguous sign of widespread prosperity. Thank you, B.C. for placing the charts in context. B.C. also passed along this investment-bank report on the same topic, The Low-Return World (Credit Suisse). Thank you, Scott F. ($5/month), for your vastly generous subscription to this site -- I am greatly honored by your support and readership. Thank you, Dominick B. ($50), for your massively generous contribution to this site --I am greatly honored by your support and readership.